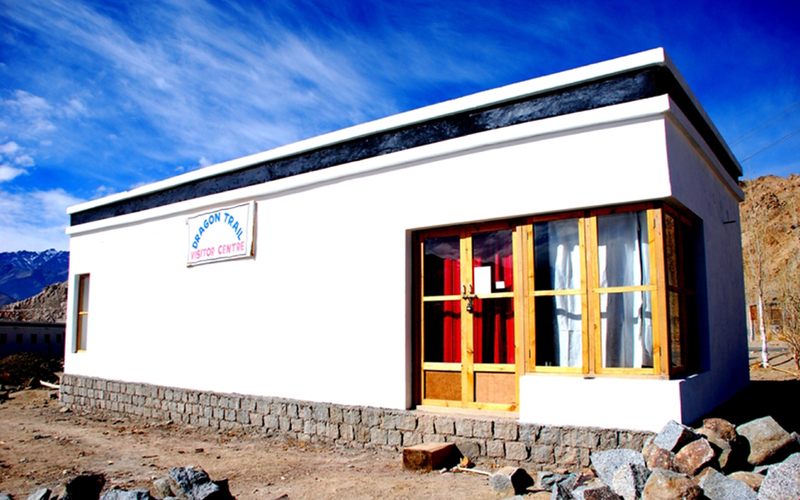 The Ladakh project was a Research/Design/Build initiative to aid the Druk White Lotus School (DWLS), a small Buddhist school located high in the Indian Himalayas. Designed by Arup Associates, the school serves children ages 3 to 14 and continued to be expanded each summer to provide classrooms and dormitories for the upcoming year. The school has won several international design awards, combining traditional Ladakhi architecture with a focus on sustainability—ventilated trombe walls, solar driven latrines, as well as unique thermal insulation and energy harvesting solutions on a remote and challenging site. Because of the incredible amount of work that needed to be carried out during each extremely short construction season, a partnership was created with Arup Associates and the School to address many unmet needs. The program worked to answer the school’s call while teaching socially-driven design and construction skills to architecture students from various universities. By challenging architecture students to apply their education in the service of others, the hope is to nurture a new generation of architects to become more sensitive, reflective practitioners. This is a founding principle of the Center for Public Interest Design, as well as its direct antecedent through which the project was run, the BaSiC Initiative, also founded by Sergio Palleroni. The project launched in 2009, when the first group of students spent five weeks at the school collaborating with ARUP in the initial phase of charrettes toward improving and preserving the life of the Ladakhi community at DWLS. Research intimately tied to local site and skill, including an investigatory building of a traditional yak-hair nomadic tent, led to the construction of much-needed additions such as tensile shade canopies, a willow pergola, a rammed-earth greenhouse learning center, and an instructive demonstration water fountain. In 2010, students collaborated through several group charrettes to design a much-needed Visitor Center for the School. Using traditional Ladakhi mud-brick construction techniques, the Visitor Center incorporates a greeting space with a corner window and seating area for serving tea; a gallery space for displaying artifacts, information about the school, and student artwork; and a custom built semi-transparent cabinet that divides the two rooms while providing additional display space. The benefits from four skylights, which highlights details that include a hand-carved wooden bond beam and an angled partition wall used to bounce light into the space. Another major component of the work in 2010 was dedicated to the creation of a ceremonial tensile pavilion to be used by the School as an outdoor pavilion. The Peace Pavilion was designed and built in collaboration with Sarah Bonnemaison and Christine Macy of Filum Ltd, renowned for its fabric structures. Constructed from disused military parachutes, it is a fitting reminder of the intrusion of war on everyday lives – yet also highlights the goodness that can emerge from conflict. Disused military parachutes from the nearby regions are a common currency and a daily reminder of the surrounding conflict. Students and faculty worked with local pupils and Buddhist nuns to reimagine and re-stitch together parachutes from this region of conflict into a pavilion. The parabolic hyperboloid tensile form resolves structural and design issues in a structure that symbolizes peace and unity that this school and children hope for amidst the chaos of war and conflict in the region. In Ladakh, the Commonwealth Pavilion is a place for children and adults to meet, to share music, drama and ideas. At a practical level, it is a sanctuary against the intense sun hitting a country founded at an elevation of 13,000 feet. In the fall of 2010 the Pavilion was showcased in London as a prime example of innovative architecture improving the lives of others before It returned to Ladakh to assume its place at the center of this academic community.